The Fourth of July may be over but the fireworks are still going off on Wall Street. The Dow cruised to fresh all-time highs on Wednesday as worries about a possible bubble in biotech and social media stocks quickly faded. Instead investors focused on a lot of good news, including stronger growth in China, a string of upbeat earnings reports and lots of companies merging and buying. 1. 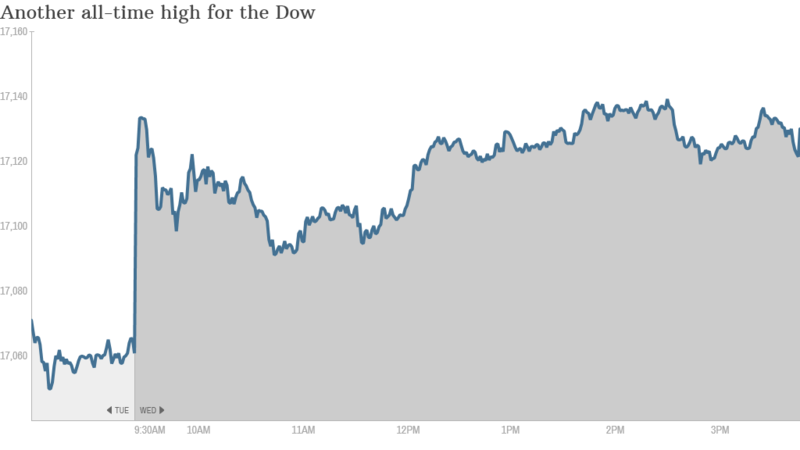 Another record-setting day: After tumbling below the 17,000 mark last week, the Dow Jones industrial average has emphatically clawed its way back. The index set a new all-time intraday record of 17,139 on Wednesday and also notched a new closing record: 17,138. The S&P 500 fell just short of its 26th record close of the year, but still advanced 0.4%. The Nasdaq also finished in the green, rising about 0.2%. 2. Show me the deals! 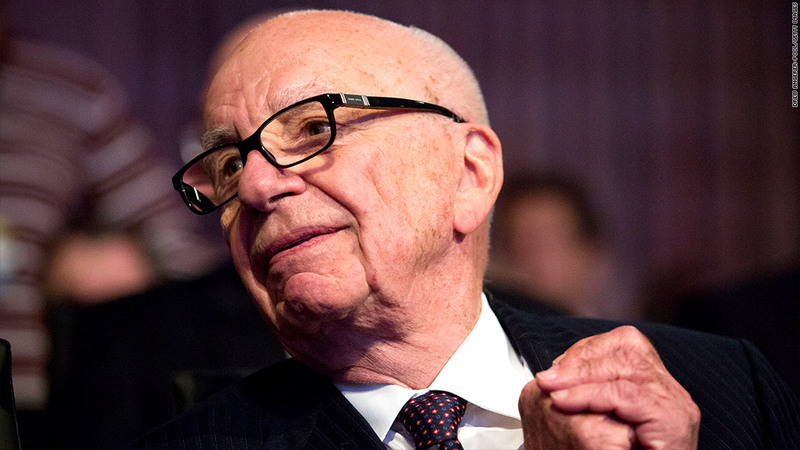 Time Warner, Fox, Apple and IBM make headlines: Rupert Murdoch is shaking up the media world today. Shares of 21st Century Fox, which also owns Fox News and The Wall Street Journal, dropped 6% on the M&A buzz.. While Time Warner rebuffed the buyout, stay tuned for more drama in this compelling story. In the mean time, the Time Warner bid drove up prices of other media stocks, including Discovery Communication, (DISCA) Viacom (VIAB), CBS Corp (CBS), Comcast (CMCSA) and Scripps Networks Interactive (SNI). ESPN parent Walt Disney (DIS), rumored to be a potential player in the Time Warner saga, closed lower. Some are wondering whether the Murdoch move could be a bearish signal for the broader markets. "I'm happy to take bets that Murdoch using one inflated security to purchase another won't mark top of US markets. $TWX $FOXA," said StockTwits user sspencer_smb. In the tech world, shares of both IBM (IBM) and Apple (AAPL) floated higher after they announced they would join forces to offer iPhones and iPads preloaded with special software developed by IBM. The alliance drove down shares of BlackBerry (BBRY) by nearly 12%. 3. Earnings roll in: Corporate report cards continue to largely impress, or at least the ones Wall Street cares about. Intel Corp (INTC) popped 9% after the chip maker posted earnings that beat expectations and announced plans to boost its share repurchase program by $20 billion. Intel is now the top performing stock in the Dow for 2014. Unlike many of its rivals,Bank of America Corp (BMLPRG) fell 2% after reporting a big drop in second-quarter earnings. While its profits exceeded expectations, BofA disclosed a $4 billion legal charge, showing the bank continues to be dogged by legal headaches. Speaking of bank headaches, PNC (PNC) dropped 3.5% after reporting a slight drop in profits and revenue. Over in the tech world, Yahoo (YHOO) slid 5% in the wake of reporting second quarter revenue and profits that missed forecasts. After the closing bell, eBay Inc (EBAY) reported earings that narrowly beat expectations, and it didn't give a very optimistic outlook for the third quarter. The stock fell slightly in after hours trading. Results from Taco Bell owner Yum! Brands (YUM) also failed to increase investor appetite. The company's stock ticked lower despite posting a 6% jump in global sales amid growth in China. 4. China GDP & Fed's Beige Book: The world's second biggest economy grew by 7.5% compared with the same period last year, despite continued worries about a slowdown in real estate. It was the first time the economy has accelerated in three quarters, putting China on a somewhat better footing to reach its official growth target of 7.5% for 2014. Based on its anecdotal Beige Book, the Federal Reserve said the U.S. economy continues to grow at a modest to moderate pace. While price pressure has generally been tame, the Fed said real estate demand has only been mixed. 5. Global market overview: European markets bounced about 1% higher, encouraged by China's growth figures. Asian markets also largely closed higher.